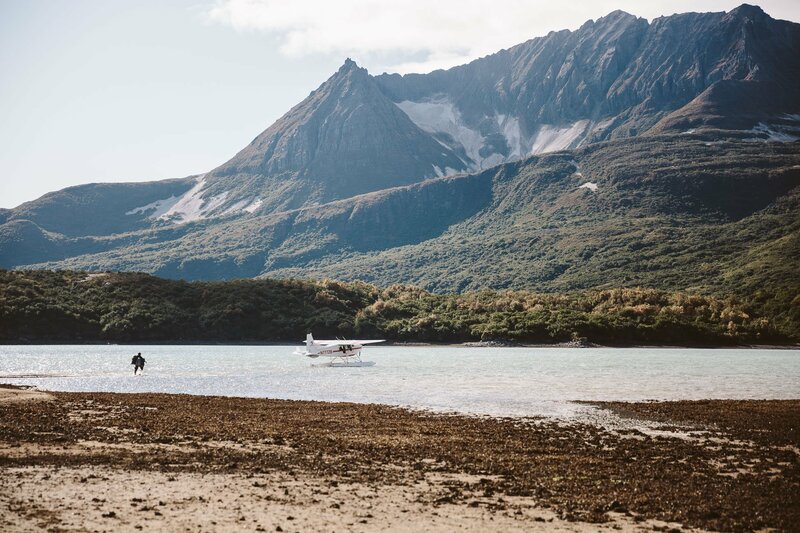 Alaska – the High North – triggers images of snowy mountain caps, endless untouched landscapes and huge brown bears in your mind. And it delivers on that promise. Plus a couple of extras: Like one of the busiest whale passages in the world. 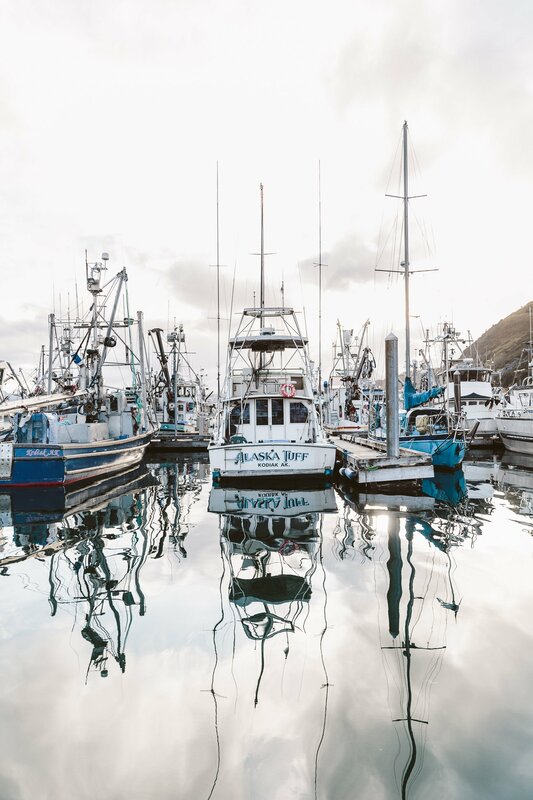 Join us for our guide to visiting Kodiak Island, Alaska! 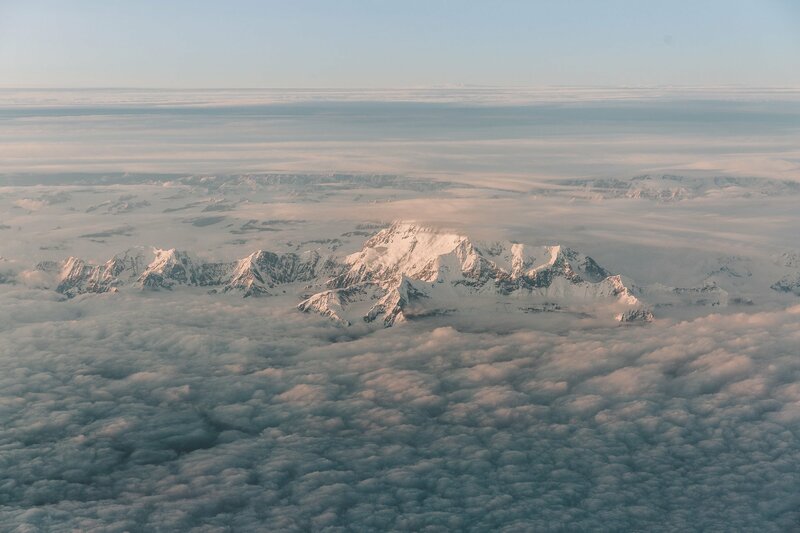 View of snow capped mountain tops from the airplane upon arrival in Alaska. 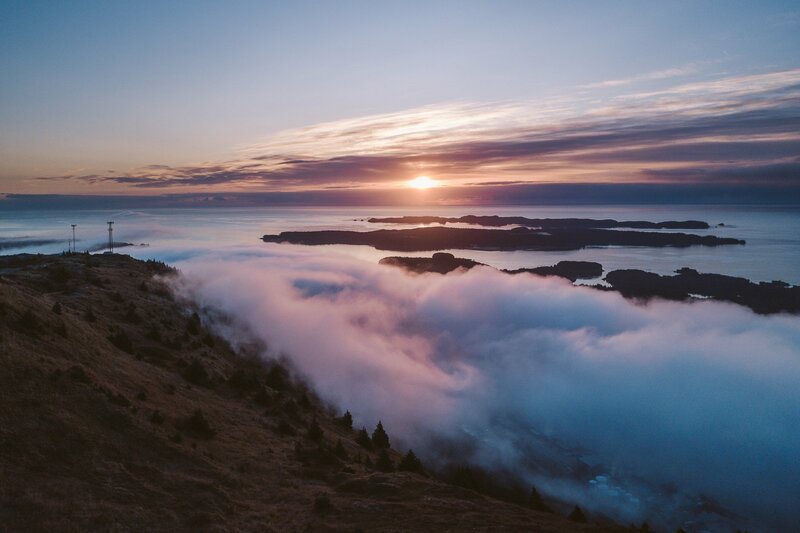 Kodiak Island is the second largest island of the United States (right behind Hawai’i). 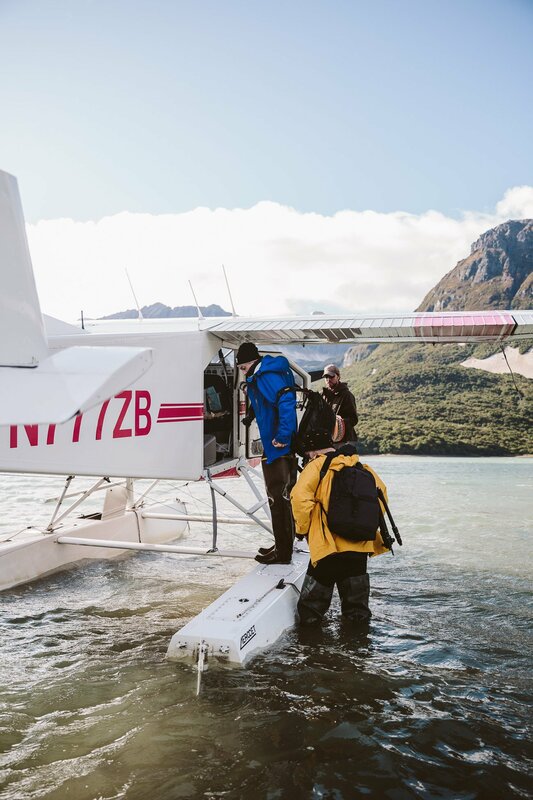 Our #1 experience was definitely the waterplane ride to Katmai National Park. Now Katmai is technically not on Kodiak Island anymore, but on the Alaskan Peninsula. 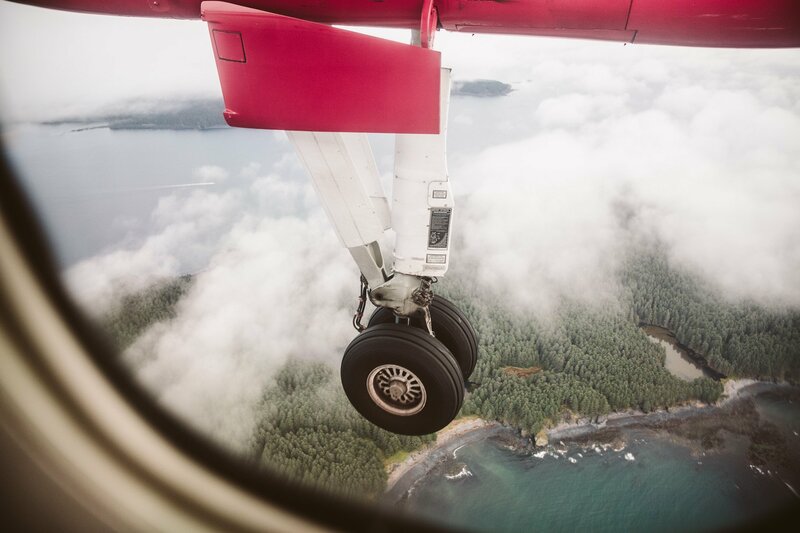 But it’s best reached from Kodiak Island. 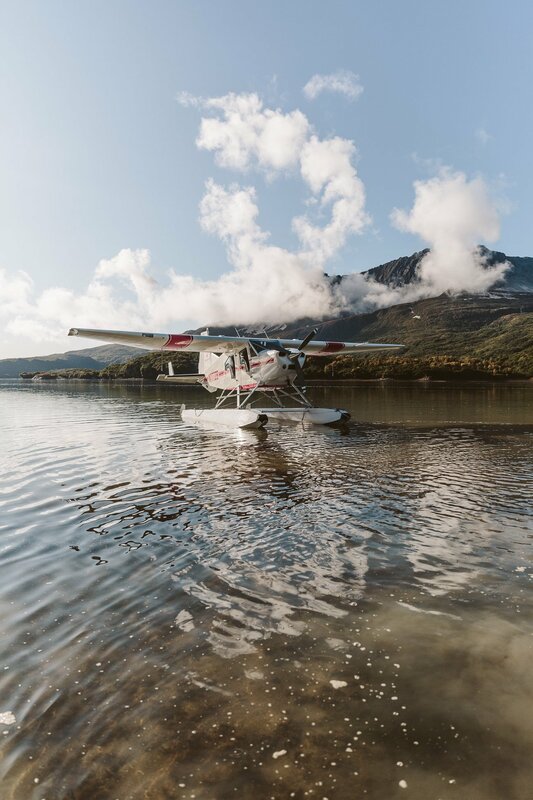 This plane by Kingfisher Aviation brought us to Katmai National Park from Kodiak Island. 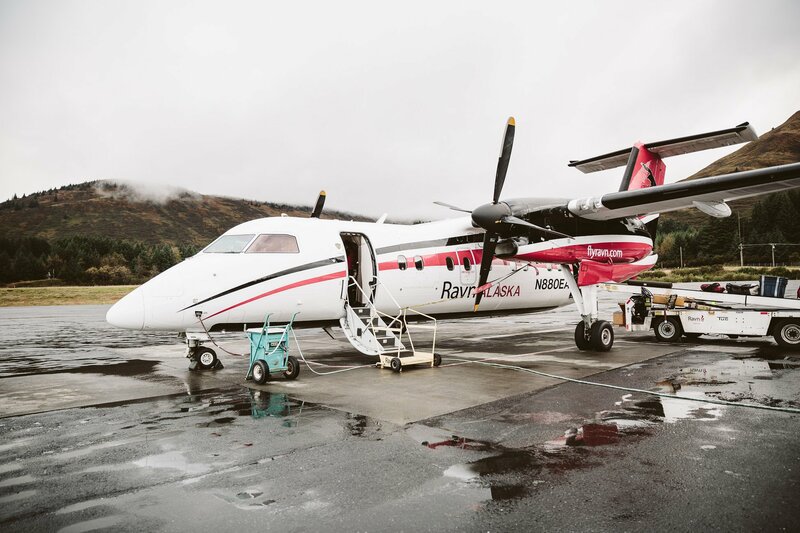 The big bonus: During the flight you’ll cross a huge part of Kodiak Island on your way there. 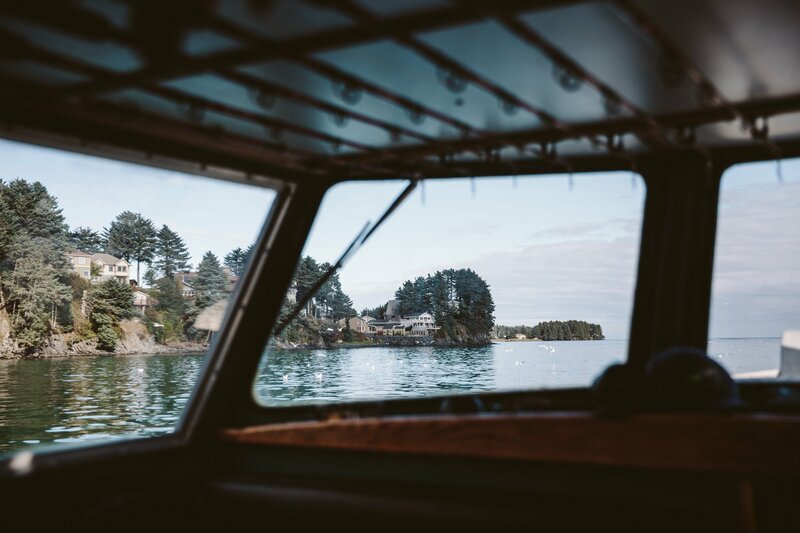 Let us assure you: The breathtaking views from the waterplane are going to fill up your camera’s memory cards pretty fast! The flight took about 45 minutes until we landed in Amalik Bay. 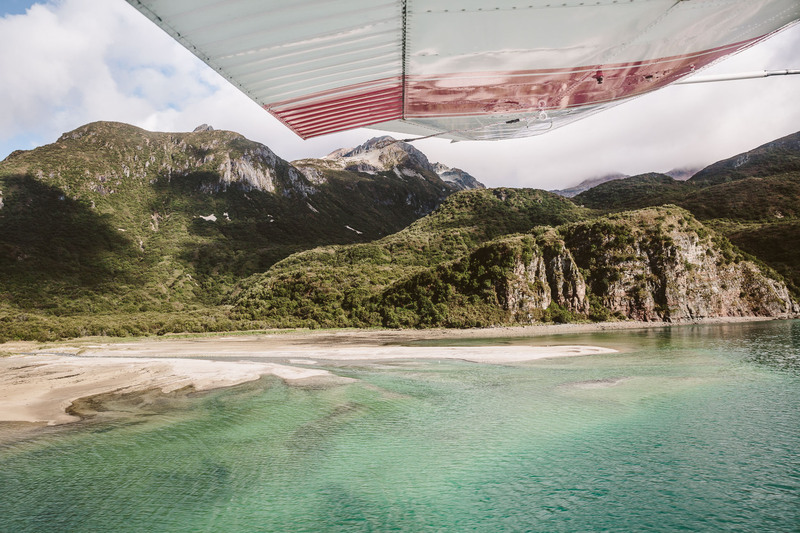 Katmai National Park is a huge wilderness area and hunting is forbidden in most of the area. Therefore it’s a paradise for bear watching. Now what we expected was that we should’ve brought binoculars if we wanted to spot any Alaskan Brown Bears. But just the opposite is true: When the waterplane landed in the bay we already saw the first bears! Alaskan Brown Bear Mom with her cub. The big plus of arriving one week after the main season is over: You’ll be alone there. Our guide Kyle from Kingfisher Aviation tells us that usually there are at least 3-5 waterplanes here at the same time. 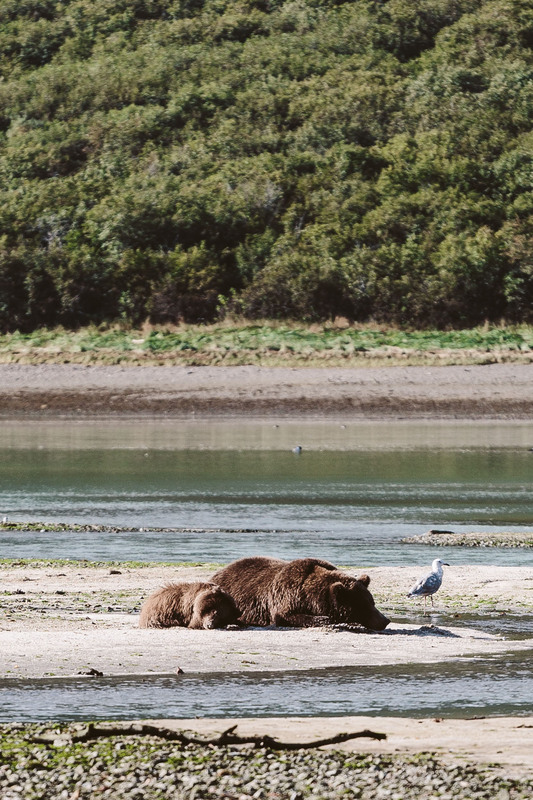 We didn’t have to share the bay with anybody – except the flocks of Alaskan brown bears, including a Mom with a two-year old cub. End of September: It’s the end of the season and the bears are ready for winter sleep. 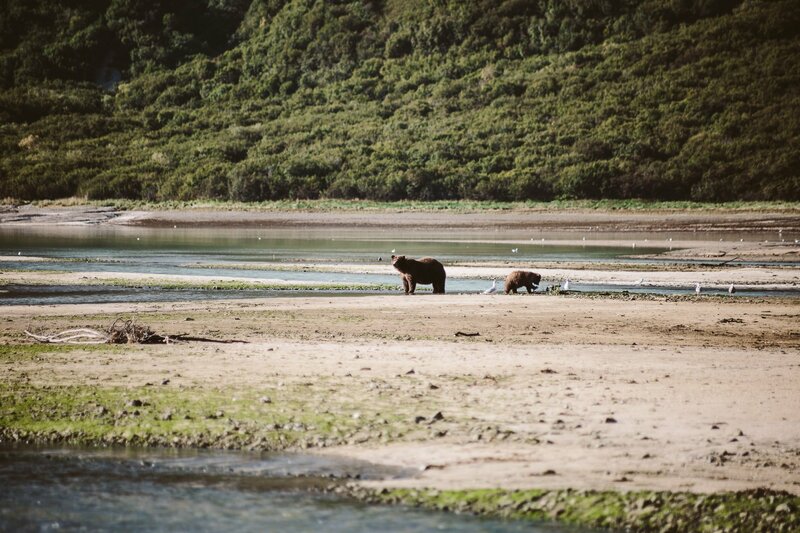 Katmai National Park is one of the least visited parks in Alaska (mainly because there’s no road access), therefore bears can really be seen in their natural habitat here. 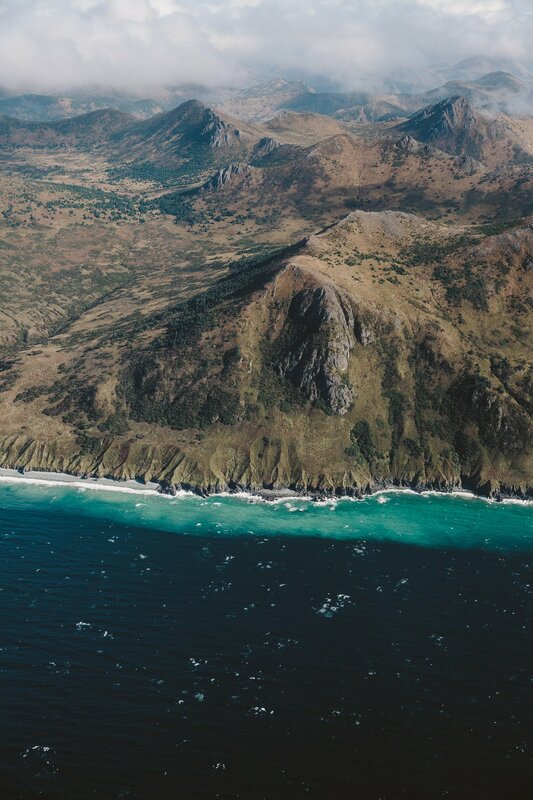 Especially the coastal areas are really secluded and therefore it’s worth the splurge to book a waterplane ride there (costs about 525 dollars per person for a 4 hour tour). 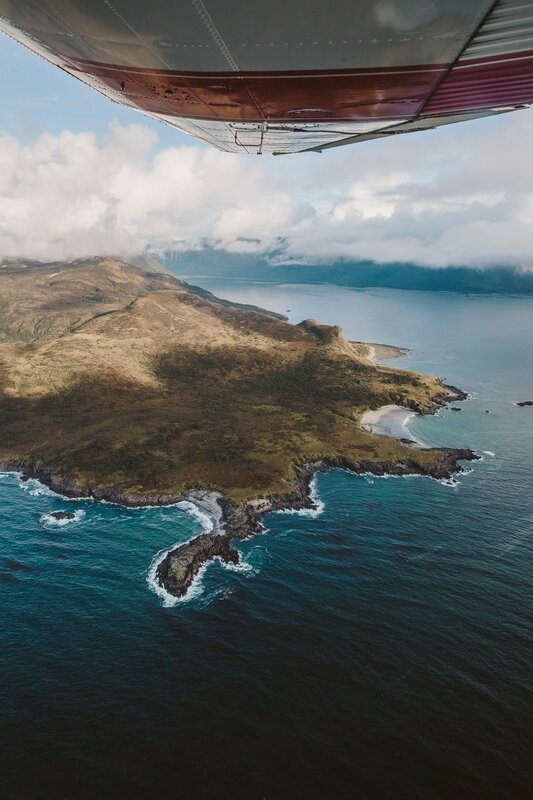 The views from the waterplane when flying over Kodiak Island are quite breathtaking! Wearing hip high boots to traverse the water in the bay. And obviously being up and close with Alaskan brown bears for more than an hour in complete silence and awe. The waterplane pilots knows exactly when to leave before the tide rolls in the bay. Bring a zoom / tele lens. 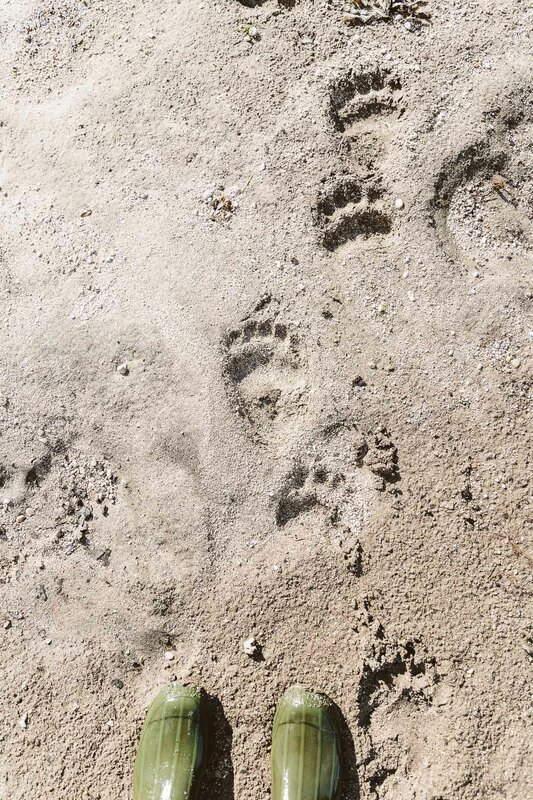 Even though you might be able to stand close to the bears you’ll want to take close-up photos as well! A 70-200mm lens is a perfect option! Maybe you got lucky and already saw a couple of whales from the waterplane like we did. 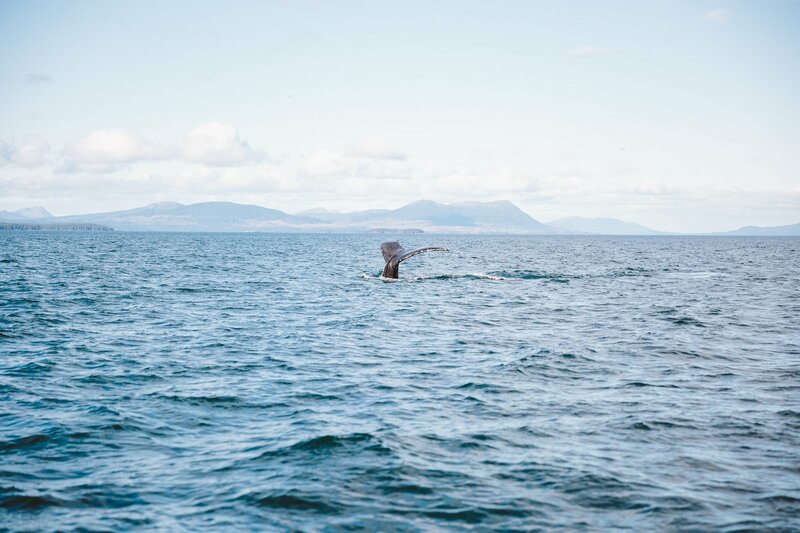 But if you want to hear the spouts and maybe even see a whale breaching, you should definitely book a boat tour for whale watching. 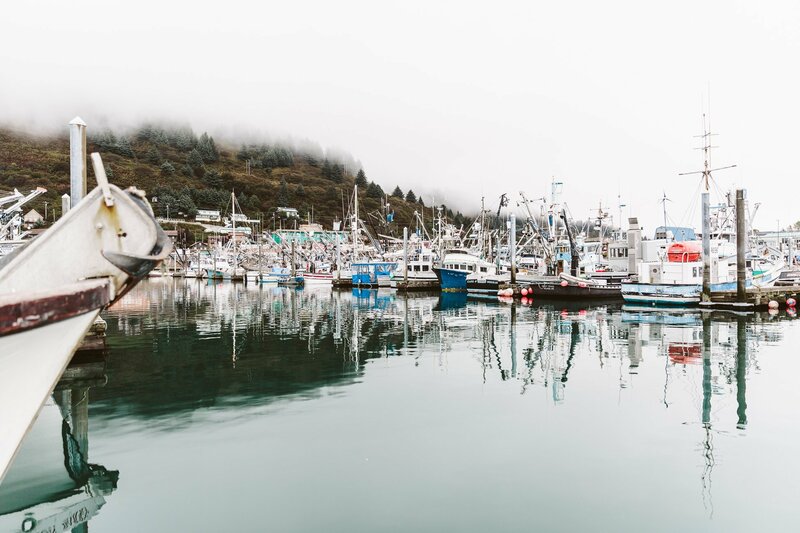 The harbour of Kodiak Island is full of fishing boats, but also some tour boats! Now the tour with Captain Dave from Fish N’ Chips Charters is a rather crazy adventure. Not only will he turn up the sound of Metallica (stating that whales love their songs), but he’ll also extend the tour by an hour, if he’s in the mood! 🙂 Captain Dave might be an original character, but he brought us to some of the best spots to watch humpback whales. 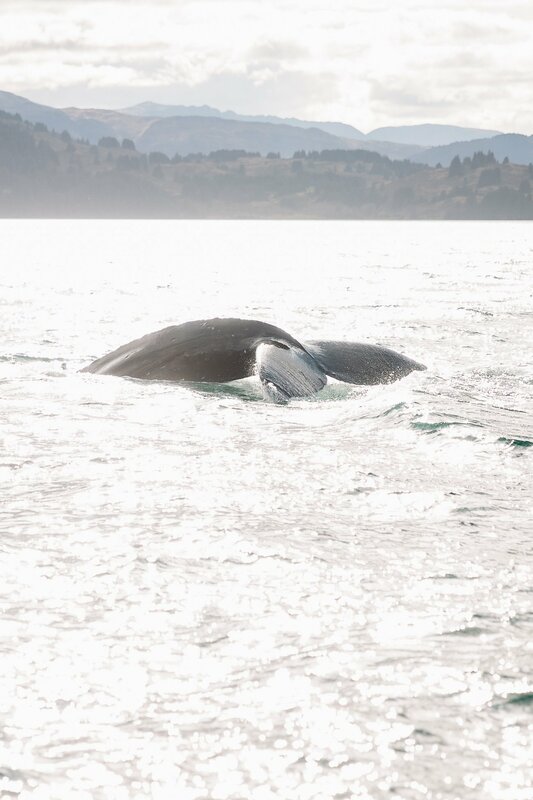 Dozens of Humpback Whales crossed our path – in the passage between Kodiak Island and the Alaskan peninsula. 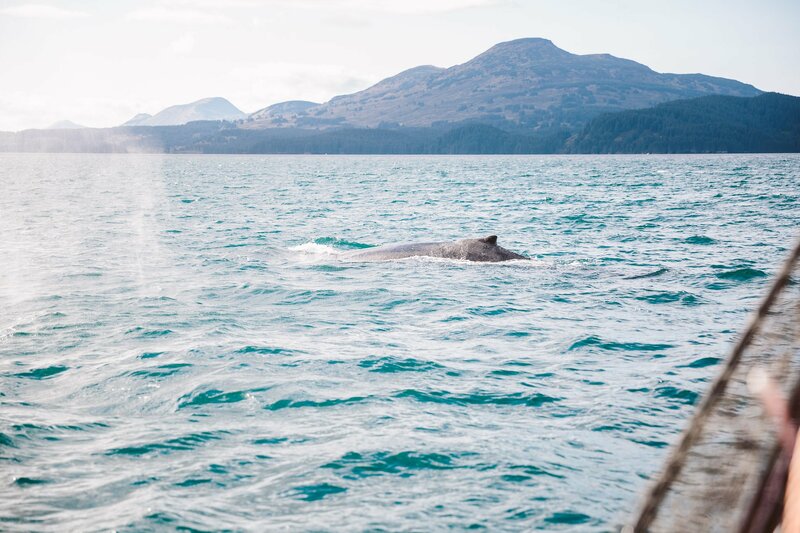 Alongside the tour we learned a lot about the island and it’s history (including Captain Dave’s youth adventures) 😉 Usually April is the main season for whale watching, as this is when Gray whales migrate North from their winter exile in Mexico back to the Bering Sea. 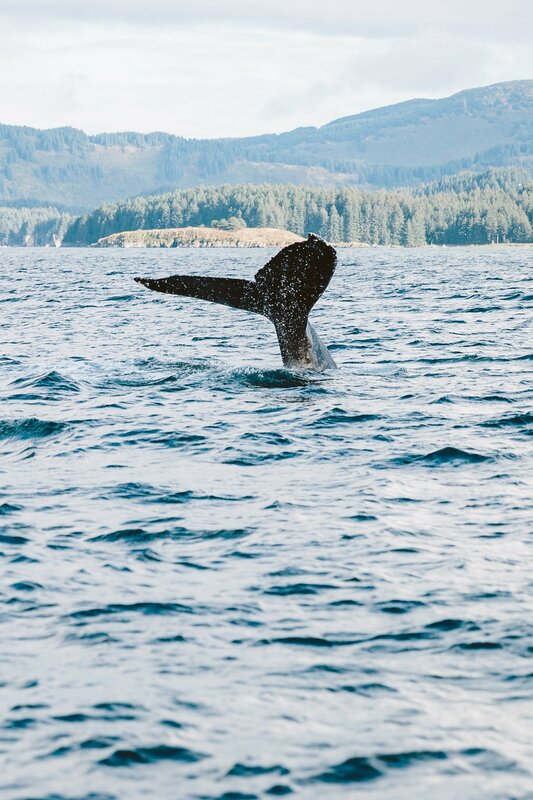 But up until October/November you can easily spot whales in Kodiak Island. We were basically jumping around on deck of the boat. The whales would turn up on the left side, then on the right, far away and suddenly close by! As a nice added bonus we also saw many sea otters and sea lions on the way. 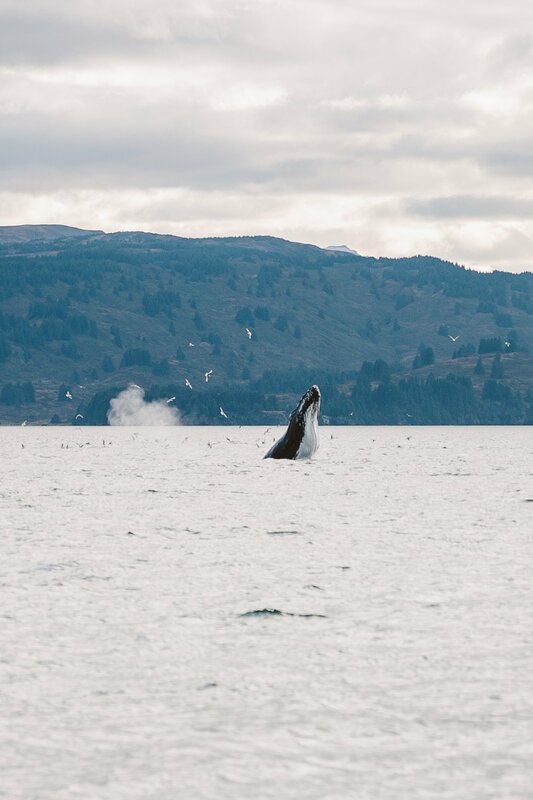 But the most exciting thing was definitely the humpback whales, that were in serious mood for breaching that day. It’s incredibly hard to catch a photo of a breaching whale – so pardon me for the mediocre photo result! 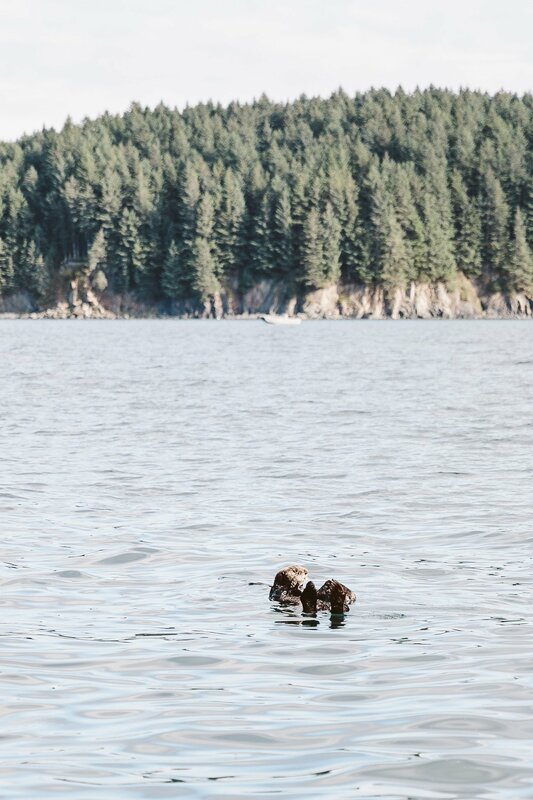 Breaching whales were the highlight of our tour – but the sea otters are also cute! The price for a sightseeing tour starts at 350 dollars per person and lasts about 3-4 hours. 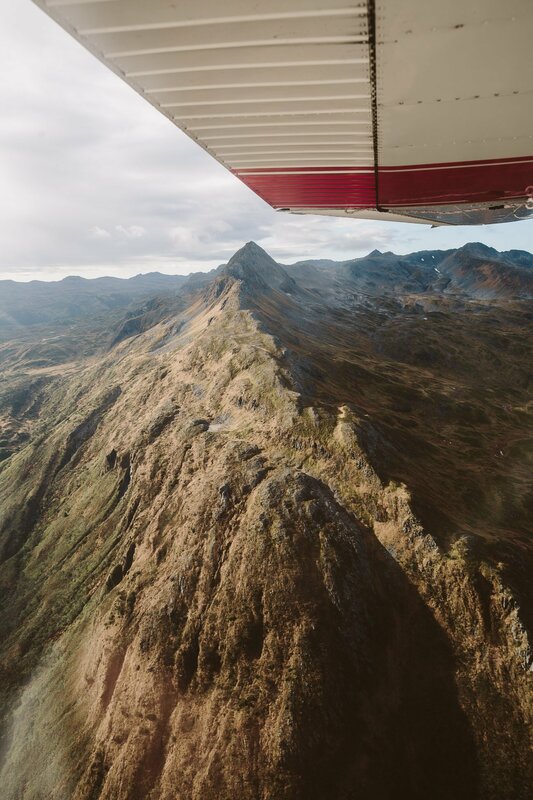 Pillar Mountain is located directly behind the town of Kodiak and is a playground for the local kids. The meet up there with their quads and bikes and use the trails for jumps and other fun stuff. Quad rider enjoying the sunset at Pillar Mountain. The sunrise view from Pillar Mountain. 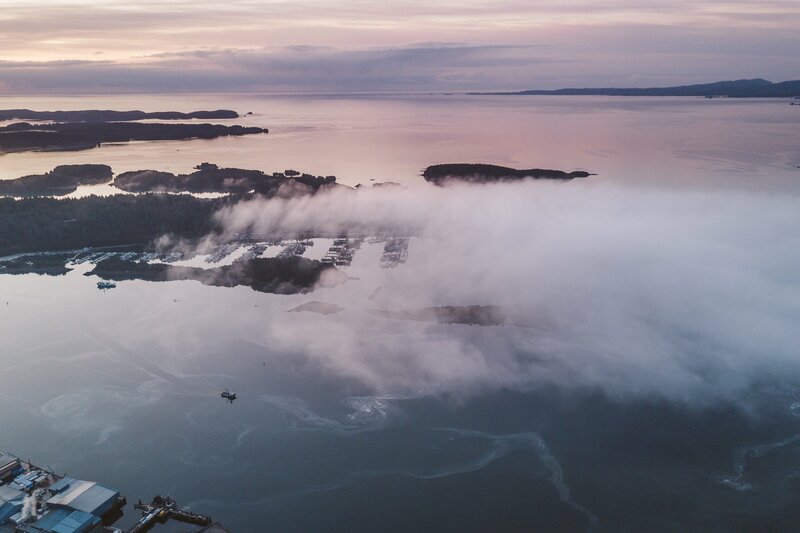 The city of Kodiak is covered by fog. The views from Pillar Mountain are quite scenic! 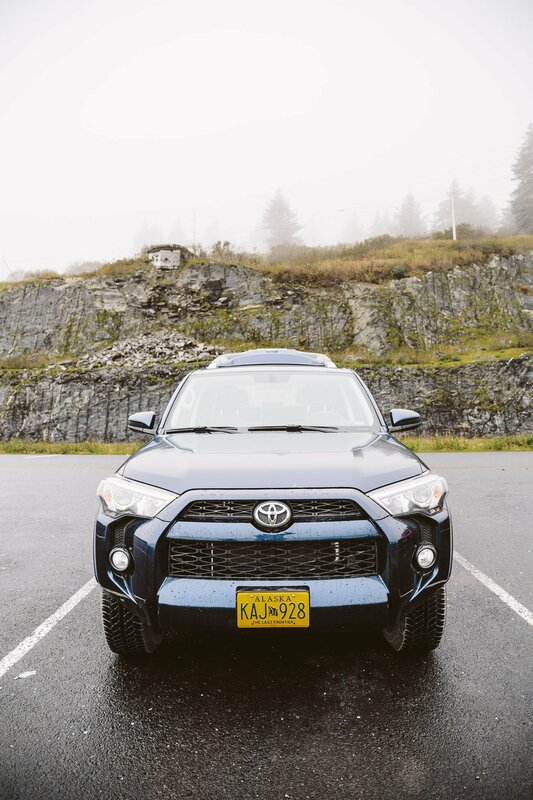 As a European, traveling to Alaska is quite an adventure. 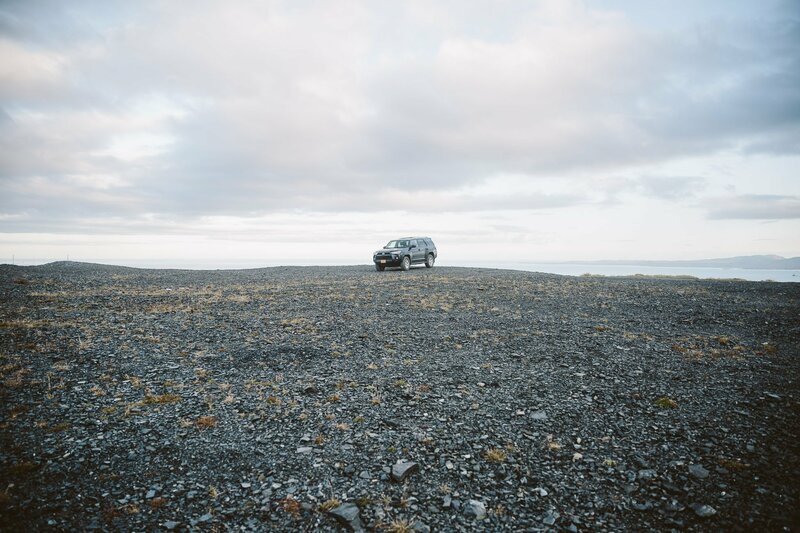 Therefore travel times are also extensive – especially after the high season in summer. 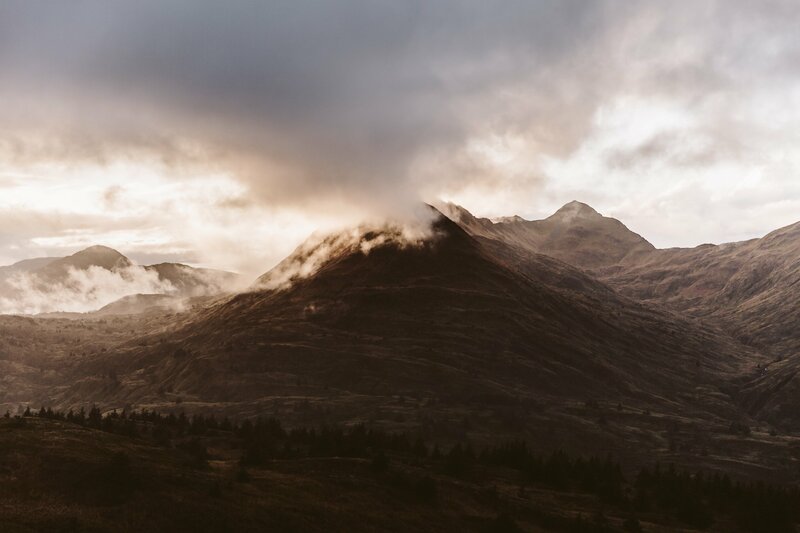 We visited Kodiak Island in the end of September, shortly after the main season. Therefore direct flights to Anchorage – the capital of Alaska – weren’t available and we had to make a stopover in Chicago. Total travel time: 8,5 hours to Chicago + 2,5 hours layover + 7 hours to Anchorage = 18 hours. Upon arrival in Anchorage we checked into our hotel for one night. 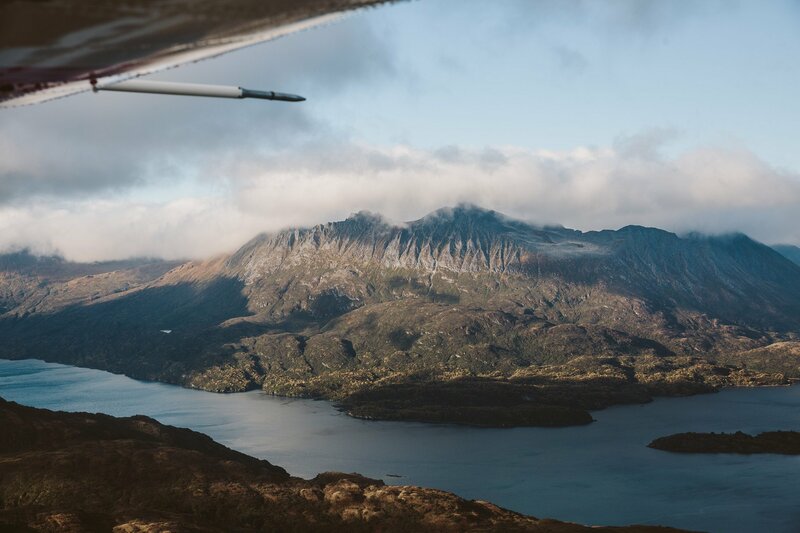 The next morning we took a small aircraft to Kodiak Island – flight time of about 1 hour. 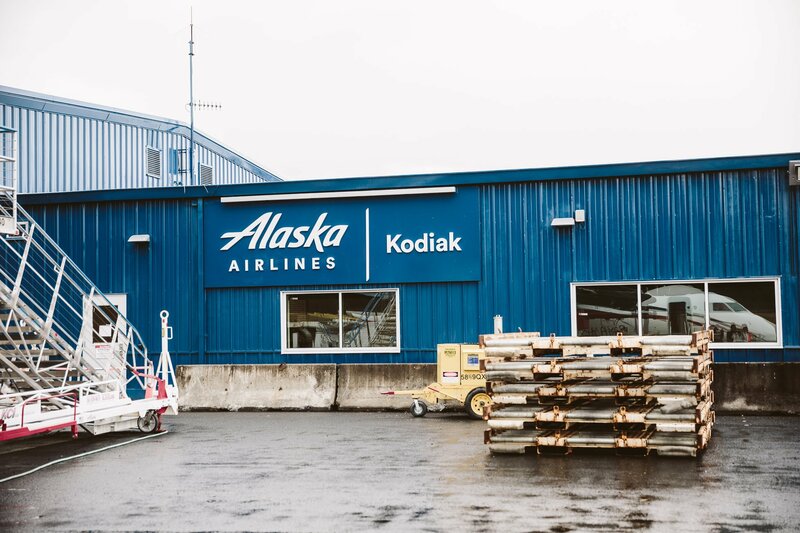 The airport in Kodiak is tiny – you’ll basically walk 10 steps from the aircraft to the arrivals hall, which consists of one baggage claim and a couple of seats. Right next to the baggage claim is the desk of the rental car company where you pick up the key for your car. In our case a huge 4×4 truck (what else?). 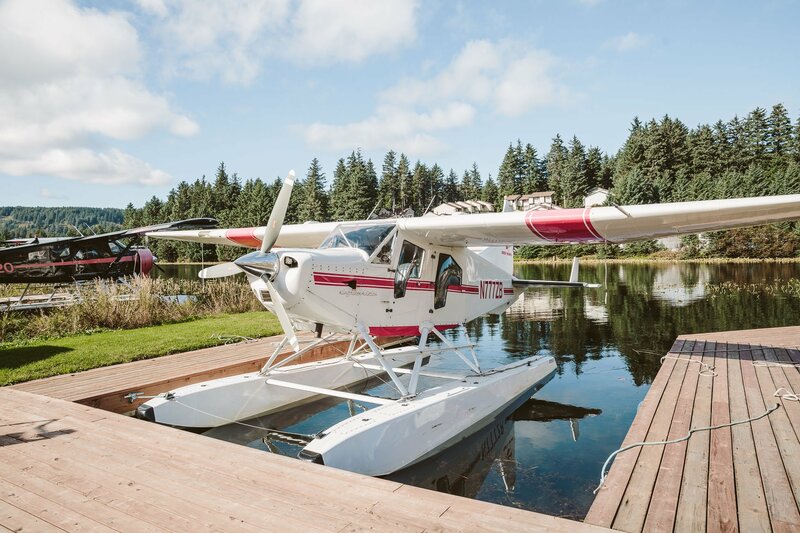 Our recommendation: Trade the car for a boat (or waterplane)! 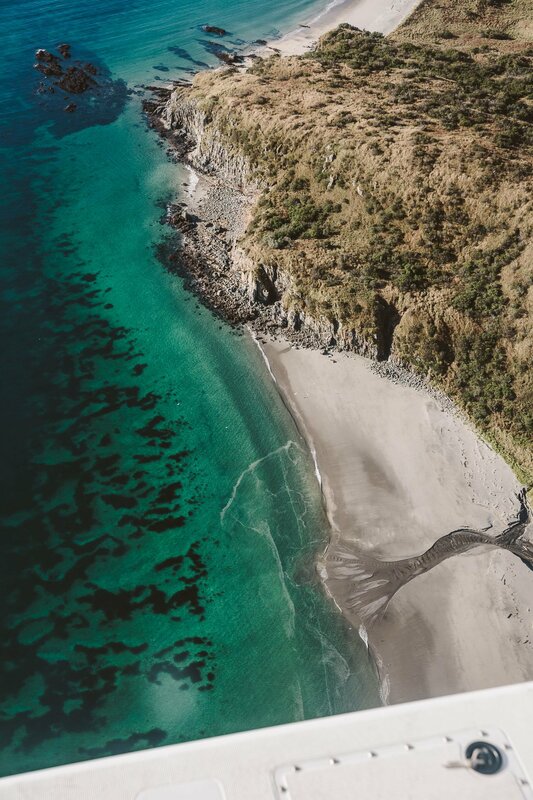 So it’s a relevant option to skip the (rather expensive) rental car and spend your money on plane and boat rides instead – if you want to discover more of the island. 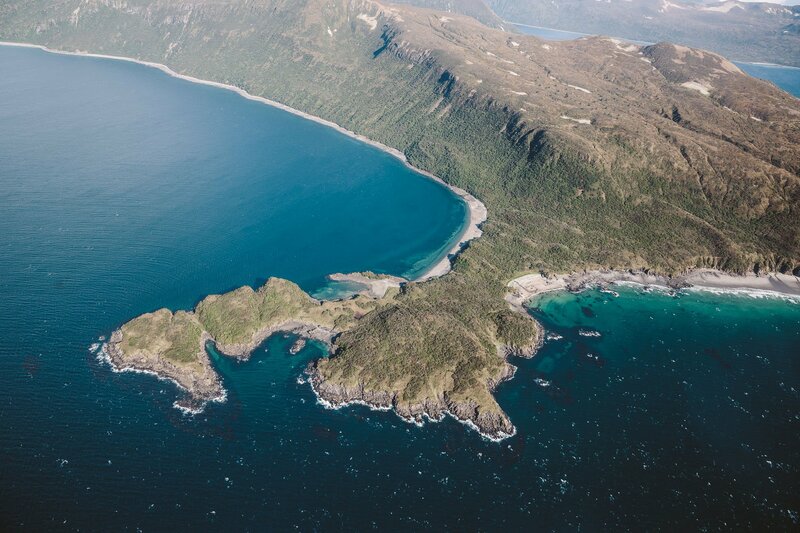 We did spend the first day driving around from Kodiak to the very Southern end of that one road (up until Fossil Beach), but obviously the waterplane and boat took us to more scenic and interesting locations! 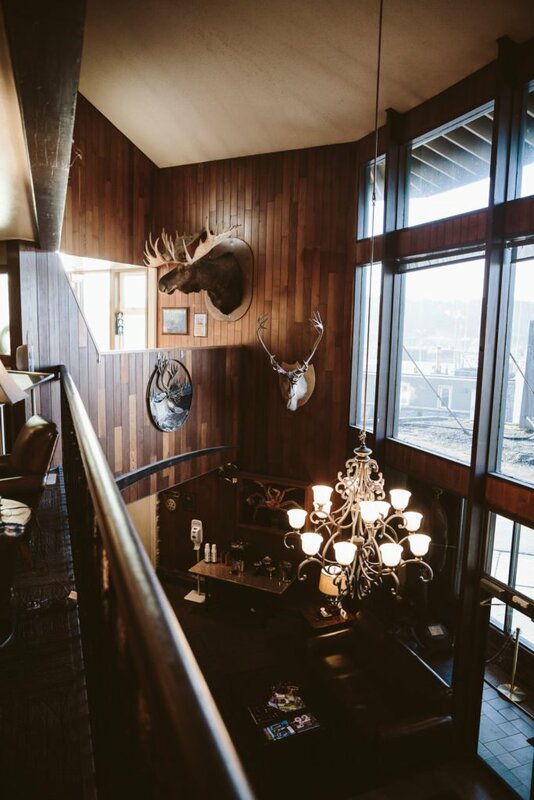 It’s not like there are many options on Kodiak Island – so we stayed in the most prominent hotel: The Best Western Kodiak Inn. Let’s be straight: It’s comfortable, very American and chances are high you’ll run into a guy dressed in Camouflage with his rifle in the hallway. As a Vegetarian you feel a bit out of place when you’re welcomed by an array of dead animals – aah taxidermy – at the reception, but after all Alaska is a hunter’s paradise. 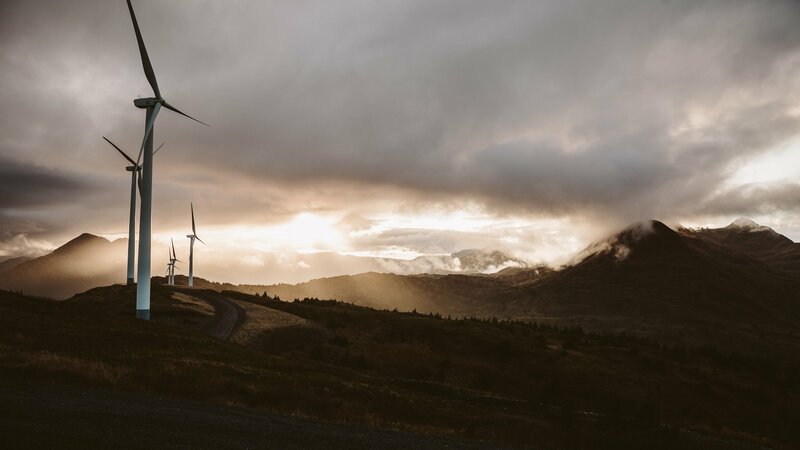 Those were our Top 3 experiences from a visit of Kodiak Island. After our visit of the island we stayed in Anchorage a bit more, although the city isn’t really a true highlight. 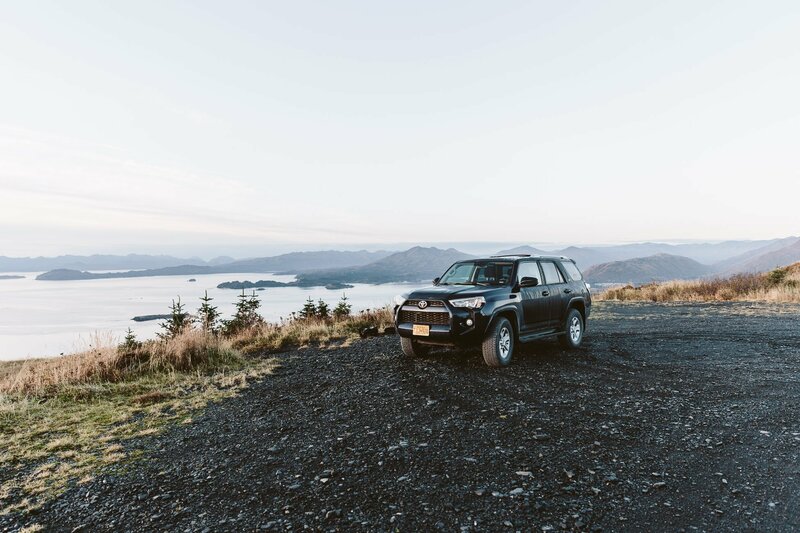 We recommend combining a visit of Kodiak Island with a road trip of Alaska and it’s famous national parks! 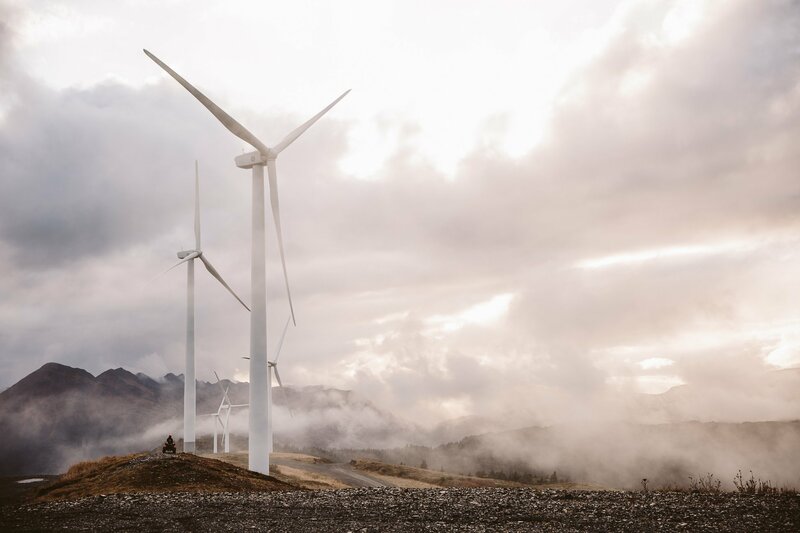 THANKS to ŠKODA Austria for making this trip possible as part of the #StartTheArrow campaign (read more about it in my blogpost announcing that you can win a trip to Alaska with me).